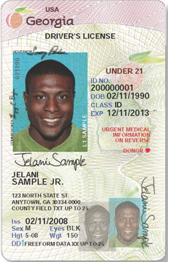 DDS appreciates your support as we continue the transition to Georgia’s New Licensing System! 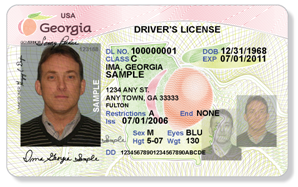 In addition to verifying driving privileges, Georgians are now presenting new Interim and permanent documents for proof of identity as they conduct business. In addition to providing additional security, the Barcode on the back of Georgia’s new licenses and IDs enables our business partners a method to quickly verify and capture the data presented by customers. Please review the brochure for more information. In addition, a sample Barcode Test Document is attached for downloading. This enables businesses to print actual card samples to use for testing. Examples of the new licenses are below. Please call (678) 413-8400 if you have questions. Customers are first issued an Interim License/ID printed on secure paper and includes photo and signature Secure Interim DL/IDs can be valid for up to 120 days. A permanent license/ID will be mailed to a customer’s address on file with DDS before the Interim expiration date. To protect your identity, please destroy the Interim when the permanent is received.